I have more than just a toasted ravioli recipe, check out more homemade recipes at the end of the page. Offering many homemade Italian recipes for you to call your own. NOTE: You may use frozen meat-filled ravioli, just thaw them. In a saucepan, cook onion and garlic in olive oil until tender. Stir in tomatoes, salt and pepper. Cook, covered, for 10 minutes; stirring occasionally. Add tomato paste and bring to a boil. Reduce heat and simmer, uncovered, for 30 minutes. Add fresh basil. Cover and keep warm. Heat 2" of oil in a large, heavy saucepan to 350 degrees. Preheat oven to 300 degrees, if you want to keep the raviolis warm. In a bowl, mix eggs and milk. Dip each ravioli into the egg mixture, then into the bread crumbs. 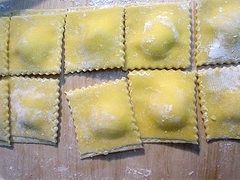 Fry ravioli, a few at a time, in hot oil for 1 to 2 minutes; or until golden brown - turning them once. Use a slotted spoon, remove and drain. Keep in the warm oven. Sprinkle with parmesan cheese before serving. Use sauce for dunking.